Available as an added service, customize the color, text and logos your clients see when they access their client tasks. The experience that your clients receive with our client task functionality can be customized to suit your firm's brand. Designs ensure that your logo is clear and visible to your clients. The domain name where your clients interact with their client tasks can also be changed. 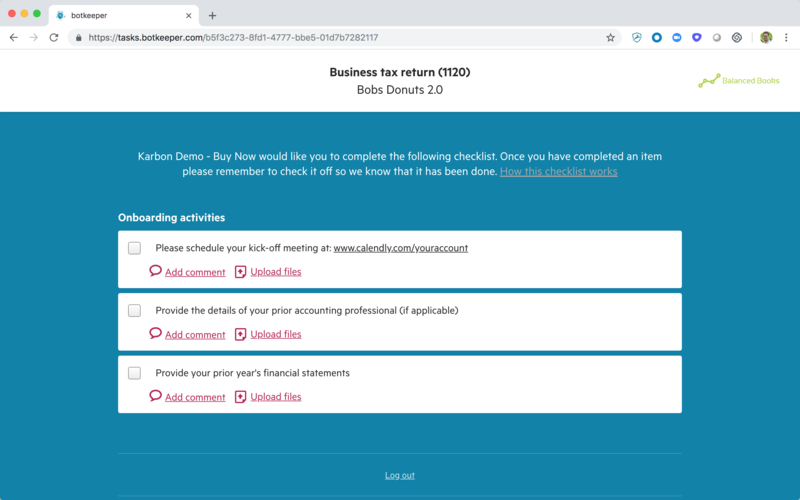 For instance instead of https://tasks.karbonhq.com, you may wish to direct clients to https://tasks.accountantsforgood.com. Please note, you are responsible for securing and providing your personalized domain name and SSL certificate (see below). This functionality can be implemented upon request for a fee (see pricing at karbonhq.com/pricing#addonTable . Please enquire with your account manager as to availability or email [email protected]. In order to customize your client task portal, you are required to secure and provide the appropriate SSL certificate in .pfx format for a minimum two-year license. There are many sites to purchase this—we recommend www.digicert.com. If you have a SSL certificate and need to send it to use in PFX format, follow these directions.